Your team is kicking into high gear to get the critical work of the project done. This at-a-glance checklist can help you prioritize and test the team's activities. Identify activities that meet the criteria: they are critical to your project's development; potentially informative; offer leeway for change; and are drawn from a wide range of options. Flag the subset of these activities in which to incorporate tests and note why you chose them. Eliminate or repurpose activities that score lowest against the above criteria. Design the prioritized actions around tests that could provide the most useful information. Consider the options laid out in the chapter (simulation, prototyping, etc.). In selecting a test, consider the utility, quality, and volume of information the test can generate along with its cost and speed of implementation. Consider integrative tests that expose potential issues for the entire deliverable. Once you decide which test to apply in each case, develop your action plan for carrying it out, identifying its tasks, inputs, timing, and responsibilities. For each activity where you've designed a test, jot down your prediction of what you think will happen and why, flagging specific assumptions that inform your prediction. 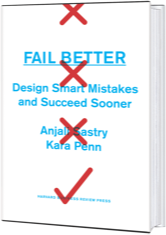 Implement the Fail Better Method in your own work with help from these checklists.